Hidden in a remote cave buried in the inaccessible rainforests of Indonesian Borneo, a series of rock art paintings are helping archaeologists and anthropologists to rewrite the history of artistic expression. There, scientists have found, enterprising painters may have been among the very first humans to decorate stone walls with images of the ancient world they inhabited, Brian Handwerk from Smithsonian.com reported. 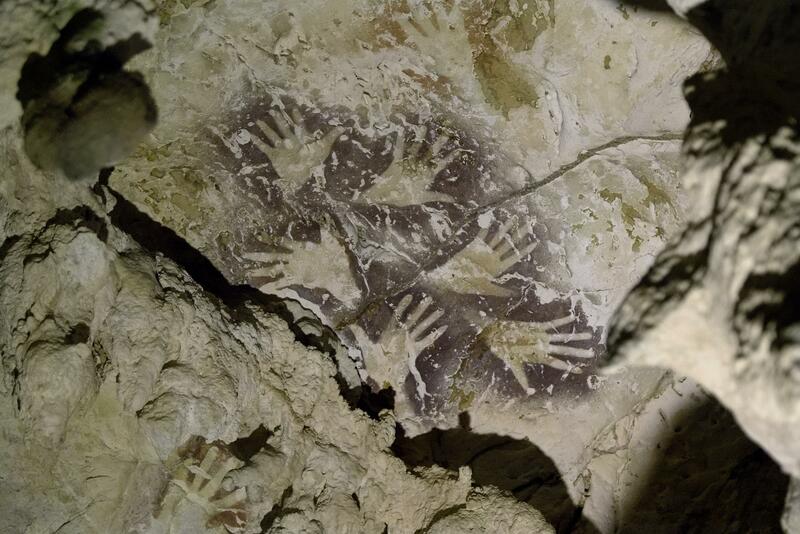 Hundreds of ancient images, from abstract designs and hand stencils to animals and human figures, have been documented in Indonesian Borneo’s remote caves since scientists became aware of them in the mid-1990s. But like other signs of ancient human habitation in this part of the world, they are infrequently seen or studied. 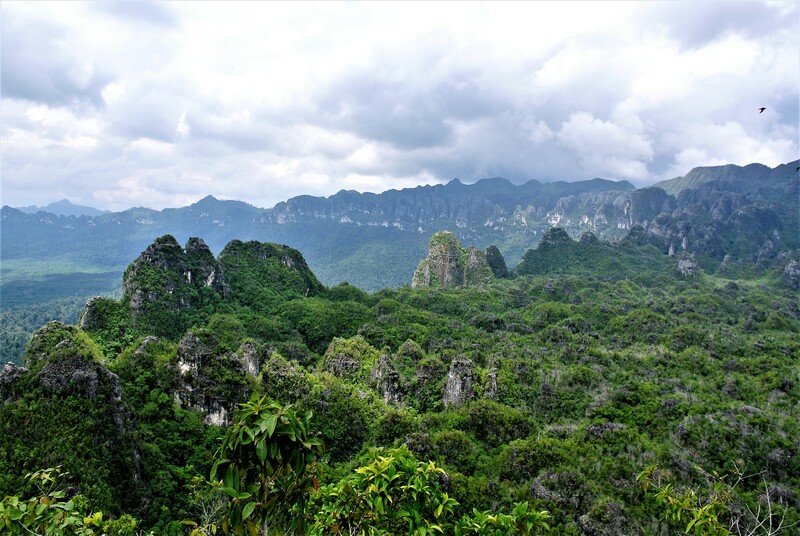 Borneo’s Sangkulirang–Mangkalihat Peninsula is a land of soaring limestone towers and cliffs, riddled with caves below and blanketed with thick tropical forests above that make travel arduous and have hidden local secrets for thousands of years. The dating of this ancient southeast Asian cave art pens a new chapter in the evolving story of where and when our ancestors started painting their impressions of the outside world. 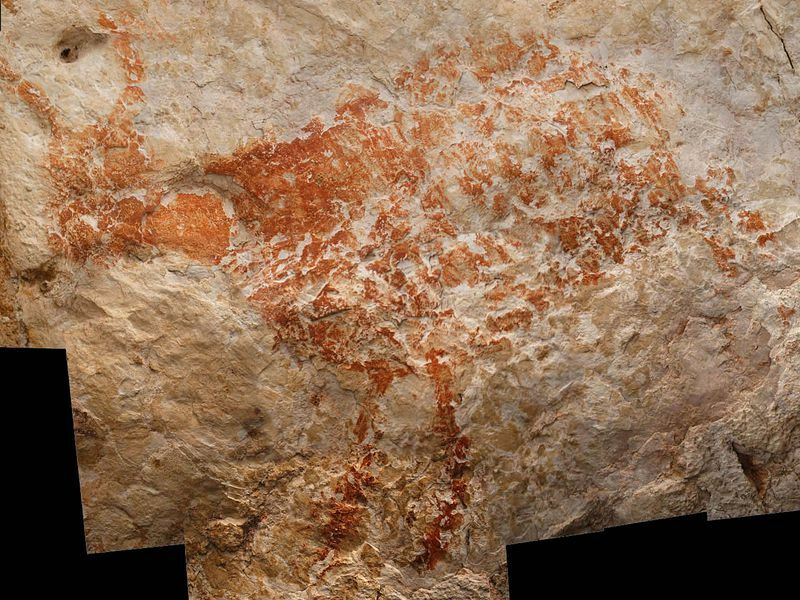 A painted rhino in France’s Chauvet Cave had until recently been the oldest-known example of figurative cave art, dated to roughly 35,000 to 39,000 years old. 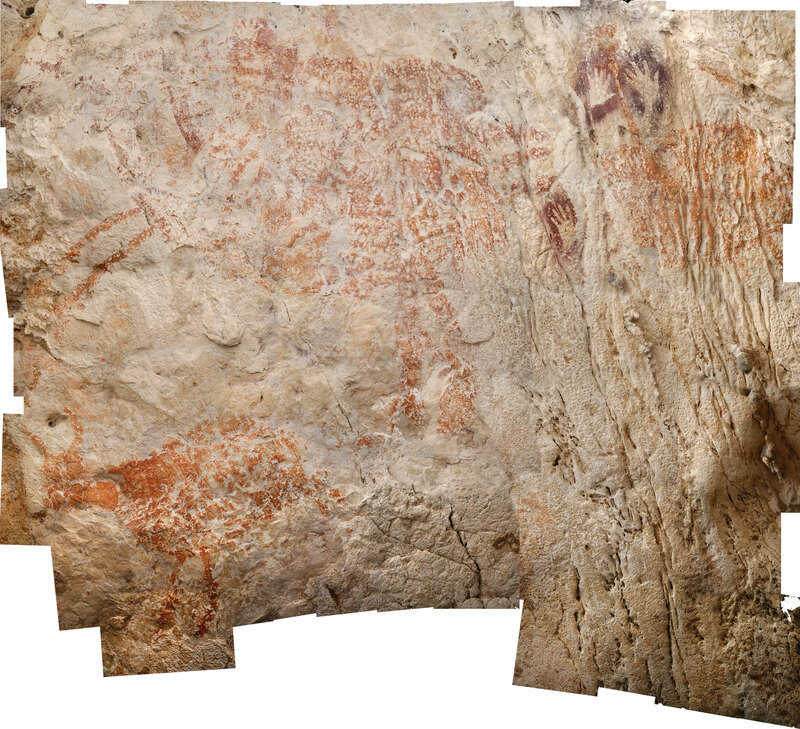 Chauvet and a few other sites led scientists to believe that the birth of such advanced painting had occurred in Europe. But in 2014, Aubert and colleagues announced that cave art depicting stenciled handprints and a large pig-like animal from the same time period had been found on the other side of the world on the Indonesian island of Sulawesi. Aubert and colleagues were able to determine when Borneo’s ancient artists plied their trade by dating calcite crusts, known as “cave popcorn,” that seeping water slowly created over the top of the art. The team dated these deposits by measuring the amount of uranium and thorium in the samples. Because uranium decays into thorium at a known rate, uranium series analysis can be used to calculate a sample’s age. And because the paintings lie underneath these crusts, the researchers conclude they must be older than the calcite deposits. Indonesia’s National Research Centre for Archaeology (ARKENAS) and the Bandung Institute of Technology (ITB) also contributed to the study published in Nature. 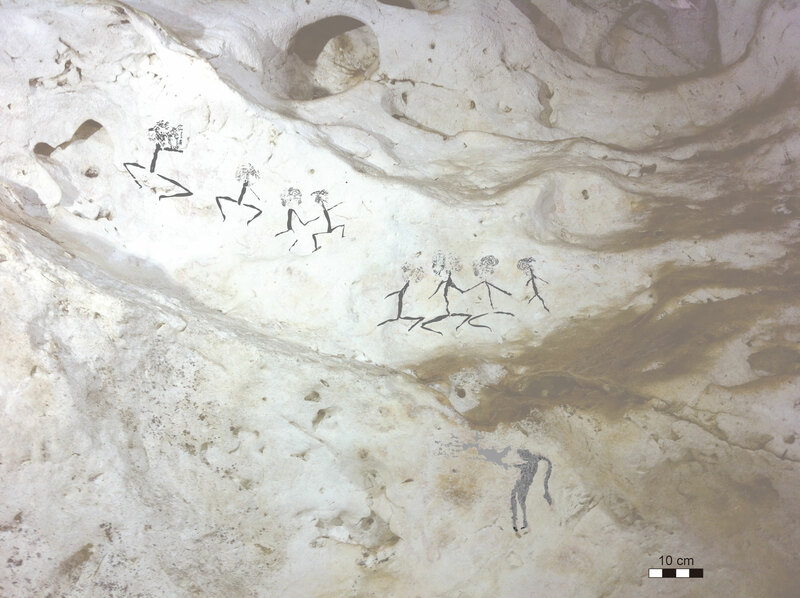 Even though the uranium dating suggests these figures are the oldest-known example of such art in the world, Aubert is even more interested in the striking similarities between the Borneo cave art styles and those found across Europe. In fact, two styles of painting found in Indonesia’s Lubang Jeriji Saléh cave --which were superimposed over one another by peoples who frequented the same cave perhaps 20,000 years apart -- also appear at roughly the same times more than 7,000 miles away in Western Europe. By 13,600 years ago, the Borneo cave art had undergone another significant evolution—it began depicting the human world. “We see small human figures. They are wearing headdresses, sometimes dancing or hunting, and it’s just amazing,” Aubert says. “It’s more about a pattern that we can see now. We have really old paintings in Europe and southeast Asia, and not only did they appear at the same time on opposite sides of the world, but it seems that they are evolving at the same time on opposite sides of the world,” Aubert says. The artistic expressions “had developed to include the use of red ochre and engraved signs on ochre lumps and stone by 75,000 [years ago] and decoration on ostrich eggshell water containers by 65,000. If we assume this repertoire left Africa with some of the earliest dispersals of Homo sapiens, perhaps on their bodies, it might explain the persistence of a form of art which, by at least 40,000 years ago had come to be extended off of the body, and things closely associated with it, to cave and rock shelter walls,” he says.